عنایت, مسعود, شعاعی, غلامرضا, نیکودل, محمدرضا. (1396). تراکم استاتیکی خاک لس و تأثیر آن بر تغییرات نفوذپذیری خاک. نشریه انجمن زمین شناسی مهندسی ایران, 10(شماره 3 و 4), 29-41. مسعود عنایت; غلامرضا شعاعی; محمدرضا نیکودل. "تراکم استاتیکی خاک لس و تأثیر آن بر تغییرات نفوذپذیری خاک". نشریه انجمن زمین شناسی مهندسی ایران, 10, شماره 3 و 4, 1396, 29-41. عنایت, مسعود, شعاعی, غلامرضا, نیکودل, محمدرضا. (1396). 'تراکم استاتیکی خاک لس و تأثیر آن بر تغییرات نفوذپذیری خاک', نشریه انجمن زمین شناسی مهندسی ایران, 10(شماره 3 و 4), pp. 29-41. عنایت, مسعود, شعاعی, غلامرضا, نیکودل, محمدرضا. تراکم استاتیکی خاک لس و تأثیر آن بر تغییرات نفوذپذیری خاک. نشریه انجمن زمین شناسی مهندسی ایران, 1396; 10(شماره 3 و 4): 29-41. یکی از عوامل کلیدی در درک چگونگی رفتار هیدرومکانیکی خاک، ارتباط مقدار تراکم و تغییرات نفوذپذیری خاک در اثر اعمال بار استاتیکی می­باشد. در این پژوهش رابطه بین تغییرات این دو عامل (تراکم و نفوذپذیری) مورد مطالعه قرار گرفته است. این پژوهش بر روی سه نمونه خاک ریزدانه از نوع لس (نهشته های بادی) که در استان گلستان گسترش دارند انجام شده است. برای انجام آزمایشات مورد نظر باید دستگاهی طراحی می­شد تا مقادیر تراکم و نفوذپذیری خاک را بطور همزمان ارائه دهد. بدین منظور دستگاهی طراحی و ساخته شده است که امکان استقرار نمونه سست با تخلخل زیاد در داخل سلول آزمایش را فراهم نموده و قادر است میزان فشار تراکم استاتیکی، مقدار تراکم و نفوذپذیری خاک را در مراحل مختلف تراکم خاک اندازه گیری نماید. در این دستگاه امکان مشاهده ساختار خاک همزمان با انجام آزمایش نیز فراهم شده و در تفسیر نتایج از مشاهدات صورت گرفته بر روی ساختار خاک کمک گرفته شده است. بدین ترتیب نتایج حاصل از آزمایشات که شامل رفتار تراکمی خاک و تغییرات نفوذپذیری آن می­باشد در این مقاله مورد بررسی قرار گرفته است. نتایج بدست آمده نشان می­دهد نوع خاک و ساختمان اولیه بر روی نحوه تراکم خاک تأثیر گذار می­باشد. نتایج آزمایشات نفوذپذیری نمونه­های خاک لس نشان می­دهد نسبت پوکی با نفوذپذیری رابطه لگاریتمی داشته و رابطه عمومی آنها ارائه شده است. The relation between Soil compression degree and the permeability changes during static compression process is one of the important factors for understanding hydro mechanical soil behavior. In this research such relationship has been closely studied. Three soil samples have been selected from loess soil (wind deposits) that extended widely in Golestan province, north eastern Iran. In first step, a test apparatus must be design to measure the soil compression degree and permeability value simultaneously. The designed apparatus is able to set high porosity soil sample in a test cell, measurement static compression force, compression degree and the value of permeability at different stages of soil compression process. In addition, soil structure can be observed during the test through a camera attached to the test chamber. The results show that soil type and primary structure affect soil compression behavior. Result of Permeability tests of loess soil shows that there is logarithmic relation between void ratio and permeability and its general form of experimental relation is proposed in this research. رشیدی، ع.، 1377. مقایسه بین پارامترهای تحکیم در آزمایش تحکیم معمولی، تحکیم با زهکش جانبی و تحکیم بزرگ مقیاس، پایان نامه کارشناسی ارشد زمین شناسی مهندسی، دانشگاه تربیت مدرس. رضایی، ح.، لشکری پور، غ.، رهنماراد، ج.، پیرانداخ، ر.، 1390. ارزیابی لس های استان گلستان بر اساس معیارهای زمین شناسی مهندسی، فصلنامه زمین شناسی کاربردی، سال 7 شماره 1، صص 40-29. رضایی، ح.، 1392. بررسی اثر تراکم دینامیکی و بارهای استاتیکی بر مقاومت برشی خاکهای لسی استان گلستان، پایان نامه دکتری، دانشگاه فردوسی مشهد. شوش پاشا، ع.، فرهادی، ع.، 1383. بررسی اثرات دانسیته بر نفوذپذیری خاک رس سیلتی، نشریه دانشکده مهندسی دانشگاه مازندارن، سال شانزدهم، شماره اول. قنواتی، ع.، محمدی، ز.، 1392. تحلیل توزیع فضایی نهشته های لسی در جنوب و جنوب شرقی دریای کاسپین، پژوهشهای جغرافیای طبیعی، سال45، شمارة 4، صص 44-29. کاظمی، ح.، بلوری بزاز، ج.، 1389. بررسی رفتار تحکیمی و ضریب نفوذپذیری افقی خاکهای ریزدانه با استفاده از دستگاه تحکیم هیدرولیکی، پنجمین کنگره ملی مهندسی عمران، دانشگاه فردوسی مشهد. Azari, B., 2015. Behaviour of Soft Soil Improved with Vertical Drain Accelerated Preloading Incorporating Visco-Plastic Deformation, Doctoral Philosophy thesis, School of Civil and Environmental Engineering, University of Technology, Sydney. Berilgen, S.A., Berilgen, M.M., Ozaydin, I.K., 2006. Compression and permeability relationships in high water content clays, Applied Clay Science, 31: 249-261. Chen, R. 1976. Emprical relationships between consolidation pressure, porosity and permeability for marine sediments, master of science thesis, Texas A&M University. Das, B. M., 2008. AdvancedSoil Mechanics, Third edition, published by Taylor & Francis. Dexter, A.R., Czyz, E.A., Gate, O.P., 2004. Soil structure and the saturated hydraulic conductivity of subsoils, Journal of Soil & Tillage Research, 79: 185–189. Fan,R.-D., Du, Y.J., Reddy, K. R., Liu, S.Y., Yang, Y.L., 2014. Compressibility and hydraulic conductivity of clayey soil mixed with calcium bentonite for slurry wall backfill: Initial assessment, Applied Clay Science, 101:119-127. Kutı´lek, M., 2004. Soil hydraulic properties as related to soil structure, Soil & Tillage Research, 79:175–184. Laskar, A., Pal, S. K., 2018. 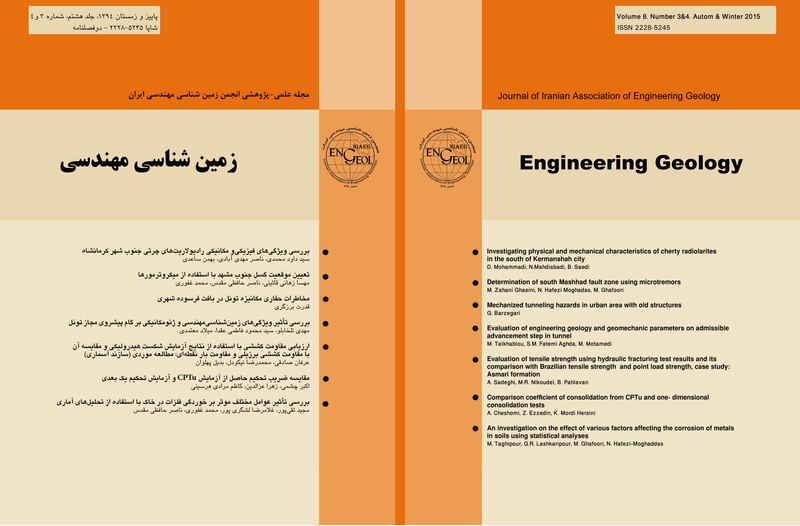 Effect of Vertical Pressure on Horizontal and Vertical Permeability of Soil and Effect of Surcharge Pressure on 3D Consolidation of Soil, Journal of Advances in Civil Engineering, Article ID 9591374, pp. 1-11. Matthews, G.p., Laudone, G. M., Gregory, A. S., Bird, N. R. A., Matthews, G., Whalley, W. R., 2010. Measurement and simulation of the effect of compaction on the pore structure and saturated hydraulic conductivity of grassland and arable soil, WATER RESOURCES RESEARCH, 46 (5), CiteID W05501. McKiernan, A. W., Saffer, D. M., 2006. Permeability and Consolidation Properties of Subducting Sediments off Costarica, Proceedings of the Ocean Drilling Program, Scientific Results Volume 205, Available from World Wide Web: (www-odp.tamu.edu/publications/205_SR/VOLUME/CHAPTERS/ 203.PDF). Mesri, Gh., Olson, R. E., 1971. Mechanisms controlling the permeability of clays, Clays and Clay Minerals, Pergamon Press, 19:151-158. Mesri, G., Vardhanabhuti, B., 2009. Compression of granular materials, Canadian Geotechnical Journal, 46:369–392. Norris, G., Elfass, S., Valceschini, R., 2001. Permeability Changes in Soil Due to Fill Loading and its Effect on the Groundwater Flow Regime, College of Engineering University of Nevada, Research Division in Nevada Department of Transportation, Technical Report, Report No: RDT 97-020. Olsen, H. W., 1962. Hydraulic flow through saturated clays, Proc. 9th Natl. Conf. Clays Clay Minerals, Lafayette, IN, USA, pp. 131–161. Ren, X., Zhao, Y., Deng, Q., Kang, K., Li, D., Wang, D., 2016. A relation of hydraulic conductivity-void ratio for soils based on Kozeny-Carman equation, Journal of Engineering Geology, 213:89-97. Rowe, p. w., Barden, L., 1966. A New Consolidation Cell, Geotechnique, 16:162-170. Samarasinghe, A. M., Huang, Y. H., Drnevich, V. P., 1982. Permeability and consolidation of normally consolidated soil, Journal of the Geotechnical Engineering Division, ASCE, No. GT66, 108: 835-850. Tanaka, H., 2003. Pore Size Distribution and Hydraulic Conductivity Characteristic of Marine Clays, 2nd International Symposium on Contaminated Sediments. Taylor, D. W., 1948. Fundamentals of Soil Mechanics, John Wiley and sons, New York, 700p. Vilarrasa, V., Rutqvist, J., Martin, L.B., Birkholzer, J., 2015. Use of a dual-structure constitutive model for predicting the long-term behavior of an expansive clay buffer in a nuclear waste repository. International Journal of Geomechanics, 16, DOI: 10.1061/(ASCE)GM.1943-5622.0000603. Whalley, W.R., Matthews, G.P., Ferraris, S., 2012. The effect of compaction and shear deformation of saturated soil on hydraulic conductivity, Journal of Soil & Tillage Research, 125:23–29. Yeo,S. , Shackelford, C., Evans, J., 2005. Consolidation and Hydraulic Conductivity of Nine Model Soil-Bentonite Backfills, Journal of Geotechnical and Geoenviromental Engineering © ASCE, 131 (10):1189-1198. Young, R.N., Warkentin, B.P., 1975. Soil Properties and Behaviour, Elsevier Scientific Publishing Company. Zhang, S., Grip, H., Lovdahl, L., 2006. Effect of soil compaction on hydraulic properties of two loess soils in China, Journal of Soil & Tillage Research, 90:117–125.